What does it all mean? 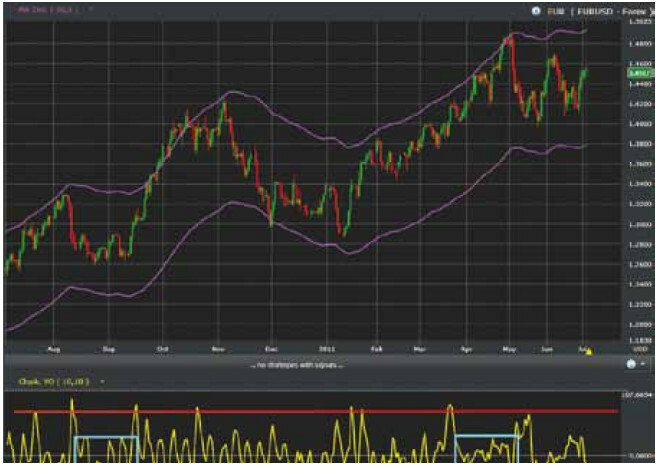 Chaikin Volatility Oscillator (CVO) is one of a range of indicators developed by Marc Chaikin. It’s used to spot market tops and bottoms by measuring volatility between high and low prices over a trading range. It can be applied to any market where high and low prices are available. Increases in volatility over a short space of time suggest prices are approaching their minimum or maximum, while a decrease in volatility over a longer time period suggests prices are at or close to a peak (maximum or minimum). How does it Work? The CVO calculates an exponential moving average of the difference between high and low for each period, typically ten days. Next, a percentage change in the moving average over a further period, typically ten days again, is applied to smooth the relationship. During periods of increased volatility, CVO spikes. During periods of low volatility, CVO trades in a narrow range. During price swing reversals the CVO initially spikes, before moving into a low volatility period as traders lose interest. It’s during the low volatility period that price reversals occur. So what are the signals to look for? The CVO is used to warn of reversals. Volatility peaks occur when prices reach an extreme and then retrace, causing a drop in volatility. Volatility should grow alongside price; each peak in the CVO should be greater than the prior peak during a price trend. When volatility fails to make a new reaction high as part of a trend (e.g. price makes a new high), then a divergence emerges and a price reversal is warned. A price break from a trading range should be accompanied by an increase in volatility. If the CVO fails to make a new high with price there is a greater probability of the price breakout failing. A rapid loss in volatility doesn’t just reflect a slowing in the rate of price movement but warns of a possible sharp reversal in price too. In August 2010, EURUSD saw a sharp drop in volatility as prices fell from a peak $1.3178 to a low at $1.2646. But, $1.2646 also formed the low for the next reversal. The narrowing of CVO for August-September 2010, highlighted by the blue box, reflected the subsequent lack of interest to push prices below $1.2646 or above newly established resistance at $1.2890. When CVO rose outside of its range on September 14th, it confirmed the price break of $1.2890. Volatility through April and May 2011 was very tepid, despite continued gains in an extended EURUSD rally. The CVO low on May 1st effectively corresponded to the price peak of the rally at $1.4809. A similar price peak looks ready to emerge in early July as CVO attempts a new push lower. This suggests traders are unimpressed with the late June mini-rally in the Eurodollar. The CVO is best used in combination with Moving Average Envelopes and/or moving averages as a confirmation signal. Price breaks of a moving average, moving average crossover or envelope breaks can all be confirmed by CVO. For example, in late September, EURUSD extended beyond its 4% Moving Average Envelope as prices hugged the line higher. However, CVO had begun to diverge after peaking in the middle of September, suggesting dwindling interest for the advance. When prices fell inside the Moving Average Envelope in mid-October, CVO was already negative. A spike in volatility on October 20th was not associated with a new price higher, further questioning the validity of the rally. Even when a new price breakout was established in early November, CVO had again diverged and was well away from the last peak; suggesting the November breakout was a potential bull trap. When do I make my move? Spikes in volatility typically occur before changes in price trends, so the CVO is a good lead indicator for reversal. Once a volatility spike is detected, the subsequent low volatility period in the CVO can be used to define price support and resistance. The signal to trade comes when defined support or resistance breaks and volatility spikes above its volatility range.